I hate throwing food away and as much as I loved my juices like the Pumpkin Sweet Potato Detox Juice but I never had much usage for the pulp. You can add to the vegetable pulp for example a bit of egg and oats and you have some kind of fritters but this was not making me really happy. Fritters are not that easy to store and when I had a lot of pulp doing fritters constantly is a bit boring. Then I bought my dehydrator and since that time I pretty much never need to throw any food away. With my dehydrator I always come up with an idea how to still preserve the food. As for example tomatoes that are overly ripe make the best dried tomatoes. These Juice Pulp Crackers are a cheap way to use all of your food without wasting anything. Some natural food store sell raw crackers for a fortune while you probably throw away the main ingredient of those crackers, juice pulp. Below you find my quick recipe for Italian Style Juice Pulp Crackers but you could also season the pulp with turmeric, cumin and some chili for a more oriental taste. Important is the flax and chia seeds that together with the pulp and water give everything its stickiness so you can press it tightly together. Since my dehydrator is round with a hole in the middle my crackers are never accurate in size but I kind of like them like that. Mix all the above ingredients in a big bowl with your hands until you have a smooth texture that is not too wet. You could also add chopped Olives, Onions for example. Have everything sit for approx. 5 minutes. Press the seasoned pulp on the sheet of your dehydrator or like I do on some parchment paper that I cut according to the shelves of my dehydrator. Dry the pulp in your dehydrator for 10-12 hours. Store in airtight containers. You could also bake them for around 35-40 minutes at 350° Fahrenheit, you just need to make sure they do not brown too much. Further the baked version will not store very well, might get mushy very quick. Serve your crackers with some cheese or hummus or any other dip. 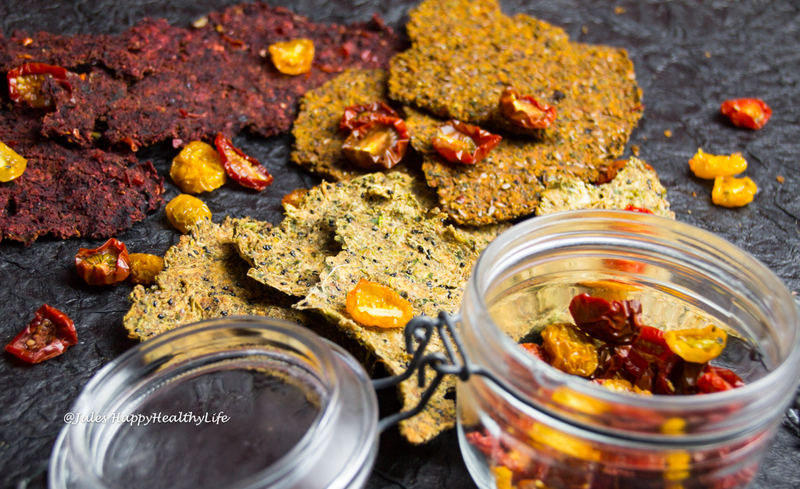 Fast, cheap and yummy way to have some nice vegan, gluten free crackers that are actually raw.